O ur genetic ancestors were once tree dwellers. At that time, our genetic ancestors depended upon products of the tree, and later upon the fruits of stalk and vine for our sustenance. Dr. Alan Walker, an anthropologist of John Hopkins University in Maryland, has done research showing that early humans were once exclusively fruit eaters. By careful examination of fossil teeth and fossilized human remains with electron microscopes and other sophisticated tools, Dr. Walker and his colleagues are absolutely certain that early humans until relatively recently, were total fruitarians. These findings were reported in depth in the May 15, 1979 issue of the New York Times. Dr Alan Walker and his associates, anthropologists at John Hopkins University, using the most modern electronic microscopic equipment; “Preliminary studies of fossil teeth have led to the startling suggestion that our early human ancestors (Australopithecus) were not predominantly meat-eaters or even eaters of seeds, shoots, leaves or grasses, nor were they omnivorous. Instead they appear to have subsisted chiefly on a diet of fruit. Every tooth examined from the hominids of the 12 million year period leading up to Homo Erectus appeared to be that of a fruit-eater.” ~ NY Times, May 1979. The essence of Walker’s research is that even though humans have adopted omnivorous and carnivorous eating practices, our anatomy and physiology have not changed. We remain biologically a species of fruit eaters. The system has been adapted to a diet of fruits and vegetables for more than 60 million years of development. A few thousand years of aberrant eating will not change our dietary requirements for optimum health. The position that humans occupy in the animal kingdom is that of the Primate order, which means that, from the point of view of anthropology, our closest animal relatives are the anthropoid apes (anthropoid means “resembling man” or “man-like”). In nature it is obvious that in “temperate” climes, at least, animals that rely upon the surplus stores of plants for their winter food have infinitely greater chances of survival than do the predacious animals who must rely upon the kill for their sustenance. The plant feeding animals thus have a great advantage over the flesh eaters. This advantage extends to many other features of life which need not be discussed here. 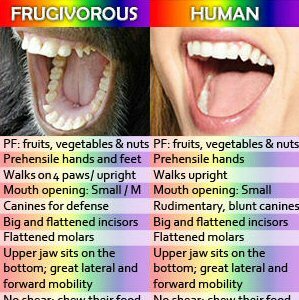 I do not intend to enter into any lengthy discussion of comparative anatomy and physiology at this place, but will content myself with saying that every anatomical, physiological and embryo-logical feature of man definitely places him in the class frugivore. The number and structure of his teeth, the length and structure of his digestive tract, the position of his eyes, the character of his nails, the functions of his skin, the character of his saliva, the relative size of his liver, the number and position of the milk glands, the position and structure of the sexual organs, the character of the human placenta and many other factors all bear witness to the fact that man is constitutionally a frugivore. 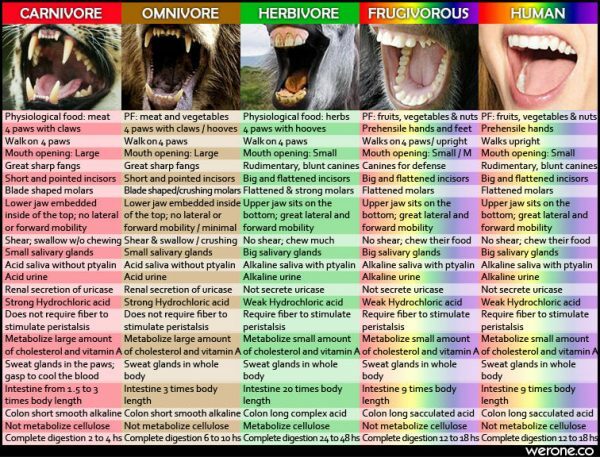 As there are no pure frugivores, all frugivores eating freely of green leaves and other parts of plants, man may, also, without violating his constitutional nature, partake of green plants. These parts of plants possess certain advantages, as has been previously pointed out, in which fruits are deficient. Actual tests have shown that the addition of green vegetables to the fruit and nut diet improves the diet. The vast majority of the human race have at all times been wholly or largely plant feeders. Human tribes that have lived exclusively upon meat and other animal foods have been exceedingly rare or non-existent. Even Eskimo tribes eat some twenty-four different kinds of mosses and lichens, including cloudberry, barberry, crowberry, reindeer moss and other plants, that grow in the arctic. It is probable that more meat is eaten by man today than at any previous period in his history. Civilization is based on vegetarianism–on agriculture and horticulture. Tribes that depend on hunting and herding do not remain stationary and do not build civilizations. “When I go back,” says Higgins in Anacalypsis II, page 147, “to the most remote periods of antiquity which it is possible to penetrate, I find clear and positive evidence of several important facts: First, no animal food was eaten, no animals were sacrificed.” Origenes has left us the record that “the Egyptians would prefer to die, rather than becomes guilty of the crime of eating any kind of flesh. Herodotus tells us that the Egyptians subsisted on fruits and vegetables, which they ate raw. Isis, one of the best beloved of Egyptian goddesses, was thought by them to have taught the Egyptians the art of bread making from the cereals theretofore growing wild and unused, the earlier Egyptians having lived upon fruits, roots and herbs. The worship of Isis was universal throughout Egypt and magnificent temples were dedicated to her. Her priests, consecrated to purity, were required to wear linen garments, unmixed with animal fibre, to abstain from all animal food and from those vegetables regarded as impure– beans, onions, garlic and leeks. “7,000,000 of the 25,000,000,000,000 red blood cells in the body of an average man die every second, so that 7,000,000 new ones must be produced every second of our lives a wonderful example of the creative operations always at work in our bodies. Island tribes have existed who had no access to flesh food and there are several peoples who abstain from meat on religious grounds. We find this so in China, India, Turkey and among the Essenes in Ancient Palestine. The Spartans were forbidden to eat meat and, like the priests of Isis, were forbidden to eat beans. There are sects in India the members of which are still forbidden to eat beans. Hindhede has shown that on the whole health and length of life are greater among vegetarian than among meat eating peoples. McCarrison has shown that the better nourished fruit-eating Hunzas of North India are the equal in health, strength, freedom from disease and in length of life of any people on earth. Vegetarian athletes have won honors in more than one field. Indeed where great endurance is required they almost always win. Many thousands of invalids have turned from a mixed diet to a vegetarian or fruitarian diet and have, thereby, saved their lives, even where they were unable to restore themselves to vigorous health. A surgeon on the staff of the Bone and Joint Hospital, New York City, who has had a wide experience among vegetarians, told me that vegetarian women give birth to their babies very quickly, “drop them like animals” with but little pain, and recuperate very quickly. He added that when he gets a call to attend a childbirth in a vegetarian woman, he wastes no time, but rushes to her bedside and frequently arrives only to find the baby born before he gets there. He also stated that wounds heal more quickly in vegetarians than others. The surgeon, himself is not a vegetarian. Professor Richet found that fruits and vegetables do not induce serum diseases (anphylaxis), while flesh foods do and interprets his findings to mean that nature vetoes certain proteids, chiefly animal, as unsuitable. Certainly no meat, meat juice or eggs should ever be fed to a child under seven or eight years of age. It has no power to neutralize the poisons from these until this time. About 5% of the flesh volume of all animals consists of waste material called uric acid that is normally eliminated by the kidneys. Uric acid is a poison to humans because it is toxic and non-metabolisable. Nearly 100% of Americans suffer some form of osteoporosis which is due in large part, to the acidic end-products of meat (and grain) eating. All carnivorous animals however, secrete the enzyme uricase that breaks down uric acid so it can be readily eliminated. Humans do not generate this enzyme. Instead, we ABSORB uric acid when meat is eaten. As a result, calcium-urate crystals form and concentrate in joints, feet, and in the lower back. These deposits lead to arthritis, gout, rheumatism, bursitis, and lower back pain. Humans are physiologically unsuited to utilizing meat as food. Natural carnivores swallow hunks of carrion almost unchewed, and the flesh is digested in the stomach with ease and facility. If humans were to do the same, we would digest very little of it before putrefaction set in and illness ensued. For some humans, meat is a pathogenic and nutritionally deficient food. Auto-intoxication and liability to infection are less in vegetarian and fruitarian than in animal feeders; many of the latter scarcely defending themselves at all, but tamely submit to parasitic imposition. Tacitus tells us that the ancient Orientals refused to eat swine flesh because they were afraid of contracting leprosy if they consumed the animal that served them as a scavenger. Bacon is particularly resistant to the digestive secretions, its fat markedly slowing down gastric digestion. Bouchard found that solutions prepared from the stools of meat-eaters are twice as toxic as those prepared from the stools of non- flesh eaters. Herter, of New York, observed that animals are killed quickly by solutions from the stools of carnivorous animals, but do not die of similar solutions prepared from stools of herbivorous animals. It is quite evident that the greater toxicity of decomposed flesh foods would give rise to more severe types of diseases, should the putrefaction occur in the stomach and intestine, where absorption can occur. This perhaps accounts for the frequent development of cancer and other serious pathologies in meat eaters. In his Presidential Address before Section 1 of the British Association, 1913, Prof. Gowland Hopkins pointed out in connection with certain important proteid reactions, that the carnivore behaves differently to the herbivore, the latter showing greater powers of synthesis and defense. As regards purity, stability and reliability, plant substances offer to man proteins and carbohydrates that are superior to those derived from flesh foods. It is known that in fruit and nut eating natives wounds heal much more rapidly than they do in flesh-eating Europeans. There is evidence to show that vegetarians and fruitarians live longer than flesh eaters. Advocates of the flesh diet attempt to counter this evidence by pointing to the short life-span of the peoples of India. In doing so they ignore all of the other factors of life that help to determine length of life. India is a land of immense wealth and the home of one-fifth of the world’s population. She possesses natural resources rivaling those of the United States. But these resources are undeveloped, the wealth is in the hands of a very few, while her millions are poverty-stricken. India is ruled by foreign exploiters who take from her a great share of what should be used to clothe, feed and house her teeming population. Ninety per cent of her people are illiterate, only thirty nine per cent of her people are well nourished while 80,000,000 of them are perpetually hungry. Besides all this, India is a land of filth–sanitation is little regarded. Under similar conditions of filth, poverty, overcrowding, ignorance, hunger and malnutrition meat eating Europe during the Middle Ages had a much shorter life span. This contrast of meat eaters with vegetarians living under similar conditions presents a brighter picture for the vegetarians. The unfitness of certain classes of substances as foods is evident from the frequency with which anaphylactic phenomena follow their use. The more closely these substances resemble the flesh of the body the more unfit are they as foods. Thus flesh is the worst offender, eggs are next and milk is last. Cancer and anaphylaxis have much in common inasmuch as they are both due to protein poisoning. Indeed, chronic latent anaphylaxis may be the long sought cancer virus. Although cancer is primarily a meat-eaters disease, we do occasionally hear of a vegetarian dying of cancer. In nearly all such cases the vegetarian is descended from meat-eaters and became a vegetarian late in life. In such cases the inherited diathesis is simply too strong to be countered by the haphazard food reform so often resorted to. Many of these “vegetarians” are really so in name only, eating fish, chicken and other flesh “non-meats” regularly. The man or woman who becomes a haphazard or a partial vegetarian and then only after some serious impairment of health has forced the change, a kind of eleventh hour repentance, will not always find salvation. A pretty picture of how “vegetarians” are made to have cancer is presented in Dr. (M.D.) Louis Westerna Sanborn’s account of cancer among the “vegetarian” Italians of Sambucci. Incidentally, in the course of his account, he makes it known that these “vegetarians” are pork-eaters and wine-bibbers–habits that have persisted since the days of ancient Rome. If the foes of vegetarianism are forced to hold up such examples of cancerous “vegetarians” in their efforts to show that vegetarians do have cancer, they are, indeed, driven into hiding. The paradox of all medical paradoxes is that physicians recognize pathology as its own cause. Etiology and diagnosis, according to the approved theories and practices of the “regulars,” starts with a developed pathology. have been told that the meat-eating Eskimo is remarkably free from cancer and we have thought that this is due to their usually short life–they do not live long and die before the cancer stage develops. But Prof. Fibiger, writing in the Lancet (London) April 5, 1924, says that cancer affects Eskimos with approximately the same frequency as Europeans. Much has been written about the failure of vegetarianism and it must be admitted that it has often appeared to fail. Most of the criticisms of the vegetarian diet have, however, missed the real reasons for the apparent failure. Vegetarians are prevented from adopting a real food reform because they have the erroneous idea that the rejection of meat is all that is required to carry them into the dietetic heaven. They do not know that a vegetarian diet may be even more dangerous than a properly planned mixed diet. Indeed, the eating of most vegetarians is so abominable that one cannot blame people for not following them. The diet of the vegetarian is often inadequate. One man who has had quite a vogue in America in recent years advocates a fat-free, starch-free, protein-free diet. His own emaciated condition speaks well for the evils of such an inadequate diet. The late Arnold Ehret advocated an inadequate diet. Others go to the opposite extreme. They accept the high-protein standard of “orthodox” medicine and consume large quantities of bread, cereals and pulses because these are rich in protein. A cereal and pulse diet with a deficiency of green foods and fresh fruits is obviously inadequate. It is deficient in alkaline elements–yields an acid-ash–and vitamins. Plant-feeders will always consume green vegetables if they can procure them and in the green parts of plants, vitamins and minerals are present in their active state and in favorable quantities. So-called graminivorous animals become ill, breed badly, and rear fewer young, it they cannot get green leaf food in addition to grains. Fruits and green vegetables were abundant in the diets of the Romans, Spartans and Egyptians and are plentiful in the diet of the Hunzas. Today the average Chinaman eats five times as much green foods as the average American. Green foods make up the greater part and during some seasons of the years, the whole diet of all vegetarian animals. Dr. Densmore strongly condemned the old vegetarian diet, made up largely, as he said, of “soft, pulpy, starchy food, spoon meat,” not alone because of the excess of starch and protein it contained but because they do “not involve mastication, the secretion of saliva in the mouth” is “not stimulated.” Saliva flows in response to a variety of substances–dry bread, or other dry starch, powdered dry flesh–but not in response to fresh raw flesh, moist bread or other watery substances. Mushes, boiled cereals, soups, purees, etc., do not excite the flow of saliva. Wrong combinations also aid in wrecking the health of many vegetarians. Except for the absence of flesh foods, their meals are often as varied and their combinations as inharmonious as those of mixed diet eaters. Conservative cooking and correct food combining were unknown to the older vegetarians, but there is no excuse for present-day vegetarians to repeat these older mistakes. The prejudice in the minds of many that vegetarianism means weakness is the outgrowth of the fact that with rare exceptions, only invalids of some sort take up vegetarianism. They are people whose stock has suffered through the indulgence of their ancestors and through their own indulgence and who now turn to vegetarianism as a means of saving their lives. They are people who have been made thoughtful through suffering and are only beginning to mend. Vegetarianism has not failed. On the contrary, it is the one outstanding success of human and animal history. Meat eating is the great arch-type of failure as the same history testifies. Are Dirty Genes At The Root of Our Health Issues? We Were Told Folic Acid Was Good for Us, but Guess What?